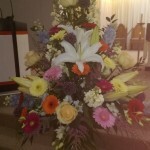 Funeral Flowers are unique to every individual and family. Choosing the right displays and bouquets for the day can be a very difficult decision to make. 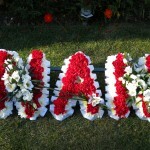 Our expertise and understanding will help you to perfectly convey your feelings towards the deceased in the form of a beautiful floral tribute. You can speak to us over the phone, email, or come to visit us at our Hertfordshire shop to discuss your options and how you’d like to express yourself. We pride ourselves on supplying a wide range of traditional and contemporary/themed designs using ultra fresh flowers for funerals. Whether you are an organiser or an attendee, we will help you find the right flowers. If you would like some further guidance on etiquette or how to express yourself when giving the funeral flowers, please just see the funeral etiquette section of our site. 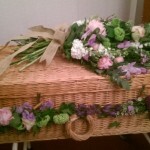 Many of the leading funeral directors in North London and Hertfordshire recommend us to their clients. We have extensive experience creating beautiful flower arrangements for funerals and always ensure that our clients get exactly what they want – we can also offer a range of custom and personalised options if you cannot find exactly what you want in our website examples. Just get in touch to discuss your requirements and timings so that we can provide you with exactly what you need. Unfortunately we are usually contacted at a very difficult time in a person’s life; we endeavour to make the process as simple and personalised as possible so that you can pay your respects in whatever way suits your beliefs and relationship. We are always available to provide support and advice, as choosing the right tribute can be quite daunting. Please don’t hesitate to get in touch and talk to our dedicated team about your needs.